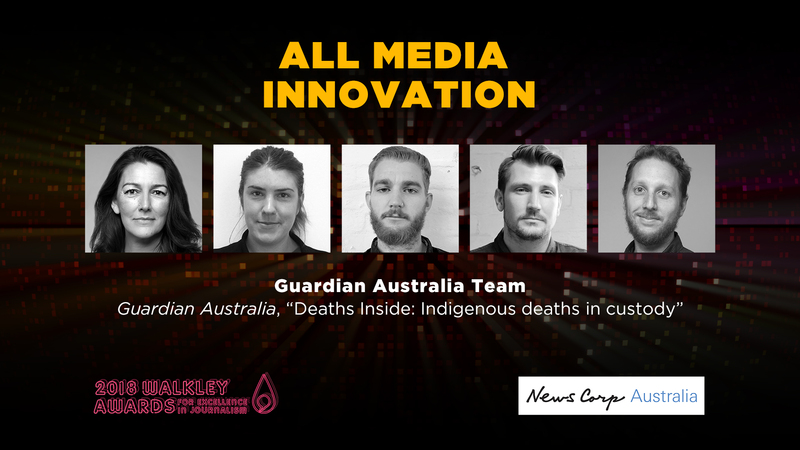 “Deaths Inside” was a months-long investigative project led by Guardian Australia’s Indigenous affairs editor Lorena Allam, data editor Nick Evershed and reporter Calla Wahlquist, with reporting by Jack Banister, Miles Herbert and Helen Davidson, website development by Andy Ball, photography by Carly Earl and illustrations by Wiradjuri artist Charlotte Allingham. Allam, a Gamilaraay and Yawalaraay woman, joined Guardian Australia in April as Indigenous affairs editor and was most recently the head of Indigenous radio at the ABC. Evershed has been with The Guardian since its Australian launch in 2013, and is a double Walkley nominee and the winner of a 2016 Walkley Innovation grant. Wahlquist was nominated for Indigenous affairs reporting in 2017. Deaths Inside found many Indigenous Australians have not been given the care they need while in custody. Specific failings were identified in a series of high-impact stories, including an accessible visualisation. The judges felt the creation of a database from hundreds of coronial reports was fresh, timely and effective.